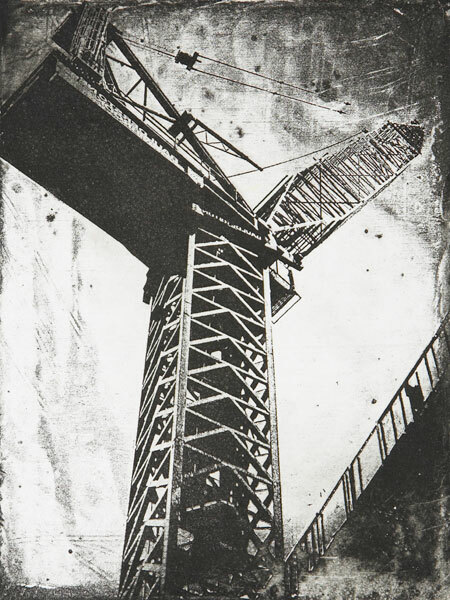 [Image: An etching by Daniel Stojkovich called Tower of Babel 2, exhibited as part of Top Arts 2007 at the National Gallery of Victoria, Australia]. I was clicking around on a local university's engineering school homepage yesterday morning when I misunderstood the way the page had been organized. For a second I thought that Comparative Literature had been re-classified as a sub-field, or specialty research group, within the university's engineering school – and so I had to wonder what exactly those students might be reading. Aside from technical manuals, what might be the comparative literature of engineering? Before I realized that I'd simply misread the list of links, I thought that perhaps there should be a comparative literature of construction sites: famous monuments, tombs, bridges, houses, and cities throughout history, together with the thoughts of the people who built them. You collect the oral histories of construction workers all over the world, only identifying what building they were working on in the footnotes; what emerges is a kind of architectural hivework with no clear purpose or outline taking shape all over the planet, with towers and stadiums and whole urban neighborhoods assembled in a fog of exhaustion and low-grade injury. You then go back through all of literature, from the Bible to the Upanishads to The Odyssey to The New York Times, culling long quotations about construction sites. The private houses of emperors; the pyramids; recollections of the construction of jungle temples; mountain lookouts in a time of war; Victorian train lines; Dubai. In fact, I'm reminded of the excellent book Dart by Alice Oswald in which conversations with people living along the river Dart have been combined into a single, long-running commentary about the riverine landscape; only here it would be a kind of Dart of architecture: thousands and thousands of construction workers and site engineers and geotechnicians and consultant elevator repair servicepersons all speaking about the act of putting architecture together in space. Epic poems of building assembly. I do wonder, meanwhile, if the temporary micro-culture of the construction site has been adequately documented by architectural historians. Industrial yards have certainly had their day, from documentaries about WWII dockworkers to historical surveys of Solidarity; and construction sites have obviously long been a focus for painters and photographers. But have literature and history given the attention due to sites of architectural assembly? Do we need a Construction Site Reader – the comparative literature of massive construction sites? I think Amy Slaton's book on concrete explores construction sites. And some work by Antoine Picon certainly does. Too lazy to provide links to Amazon--sorry. My three-year-old son would argue that we do. Fortunately, there's still time for this to be produced before he learns to read. “Spur der Steine” (The Trace of Stones) would be a candidate for the reader. It's a book by Erik Neutsch (and movie by Frank Beyer) that is mainly set on a huge socialist construction site in East Germany of the 60s. It’s an interesting insight into building (and living) in a socialist country – material is always scarce and things never seem to get finished. Michael Ondaatje's In the Skin of a Lion has some of the most beautiful passages about construction I've ever read. It describes the lives of immigrants that built the city of Toronto in the 20s and 30s - flying through the air on bridges and from girders. Don't exactly strike me as self-indulgent. Obviously, you disagree. In any case, Michael, I'll look for The Trace of Stones; it sounds great. And I'll check out Skin of a Lion, as well. I was also thinking of the book Mountain® when I wrote this post - although that isn't a book I would recommend, it is partly about the construction of a massive artificial mountain, using garbage. The private houses of emperors; the pyramids; recollections of the construction of jungle temples; mountain lookouts in a time of war; Victorian train lines; Dubai. Might not be everyone's cup of tea, but it was one of your recent posts that really caught my attention. Thanks, Chris - that's very appreciated positive feedback! Glad you liked this. A while back, I read a book about the World Trade Center called Aftermath, by Joel Meyerowitz; which contained quite a few interesting stories from the salvage workers at the Lower Manhattan site. W hile primarily a photo compilation, it had some very poingant and personal stories from what was, for all intents and purposes, a deconstruction site.